In the sermon on the mount Jesus admonishes us or presents to us the recipe that will help us to live a blessed life. It is known as the magna carta of the Christian life. It is a teaching that guides those who are serious with their faith practice and if it is hearkened to will definitely help us in doing the right which pleases God. To live a blessed live does not entail living a life without stress, persecution or suffering, but it includes all of the above and when we are able to manage it well we will be able to reap the blessings there in. Blessed are the poor in Spirit for theirs is the kingdom of God. 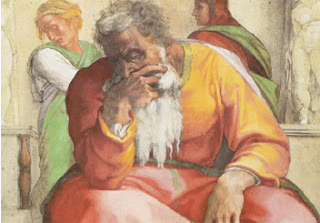 This entails recognition that whatever we possess spiritually and materially is a gift from God and as a result of that, we should not brag about it as if it is by our power that we have achieved it, rather, we should be humble enough to place ourselves at the disposal of God so that He will direct our path. Blessed are those who mourn for they shall be comforted. This is very true because we find a lot of people in our world loose their loved ones and sometimes people are hurt by others in such a way that they lament and mourn in their heart. Yes, we may be comforted by people, but the comfort that God gives is superior and the best than any other which we receive from other places. Blessed are the meek, for they shall inherit the earth. To be meek is to be gentle and humble and to do things in a manner that does not connote arrogance. A meek person shows the world the face of God and through him or her the world is made a better place. Blessed are those who hunger and thirst for righteousness, for they shall be satisfied. 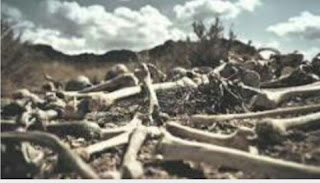 No one who is hungry goes to eat what will kill him or her, instead, you eat food to sustain yourself. As followers of Christ we must hunger and thirst for righteousness which is the real food of the spirit which gives satisfaction. To choose to be righteous is the best and it makes us to be friends of God. Blessed are the Merciful, for they shall obtain mercy. Mercy is an attribute of God and for us to resemble God as His children we must strive to be merciful like the Father at all times. When we show mercy to others we ourselves will be shown mercy by God. We must be merciful and forgive others so that we can win the mercy of God and His forgiveness. Blessed are the pure in heart, for they shall see God. This is simply true, because God is holy and those who will come before Him will be holy people. For us to see God we must strive to be pure in heart, in words and actions. Blessed are the peace makers, for they shall be called the sons of God. God is peaceful and as His children we must work for peace in the Church, homes, societies and in our world. The world needs peace and if we help to broker peace among persons and nations that are quarrelling we are being like God who is peace himself. Blessed are those who are persecuted for righteousness' sake for theirs is the kingdom of God. For us to be happy in Christ we must pass through some persecutions and if we remain steadfast till the end we will inherit the blessings in the kingdom of heaven. 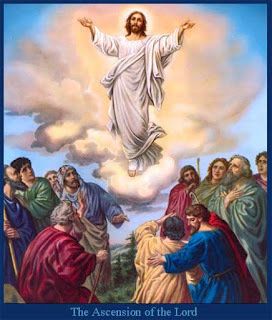 Blessed are you when men revile you and utter all kinds of calumny against you falsely on Jesus' account, Rejoice and be glad for your reward is great in heaven. It is not easy to rejoice when you are being persecuted just because you profess Christ, but Jesus is telling us to rejoice for our reward will be great in heaven. If we suffer with Him we will share in His glory and to share in the suffering of Christ is a privilege that brings fulfilment. 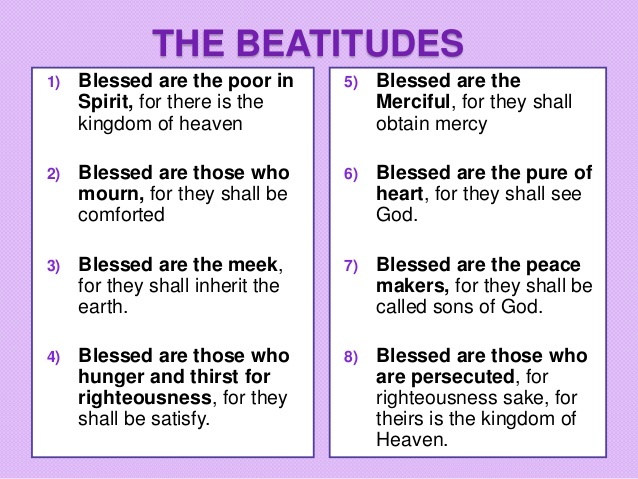 We can begin to reap the benefits of this beatitudes by applying them as a guiding principle in our daily living and striving to put them into use in our interaction with our fellow human beings. A happy life is possible in Christ and a blessed life is even better and that is exactly what Jesus is offering us in the beatitudes. 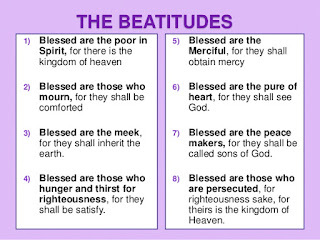 Let Us Pray: Lord Jesus, give me the grace to put into practice the things I learn from the beatitudes so that I will be blessed and be able to receive the rewards your have prepared for me. Amen.